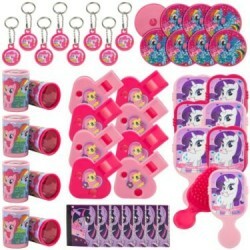 My Little Pony Party SuppliesThere are 19 products. Hand out some sweet treats or fun favors in this great My Little Pony Folded Loot Bags. 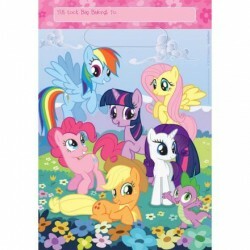 These favor bags are pink and feature the My Little Pony friends in a colorful setting. Eight bags come with each order and you can fit a ton of favors in each bag. 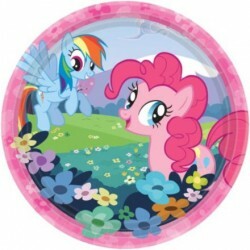 Size: 9" x 6 1/2"
My Little Pony Dessert Plates 7"
Add a colorful accent to your table with these fun My Little Pony Plates, 7 inch. These paper plates are seven inches in diameter, feature a hot pink border with flower accents, and My Little Pony characters front and center. Eight plates come with each order. The My Little Pony 9 oz. Cups are a fun party item that you can include when setting your table. 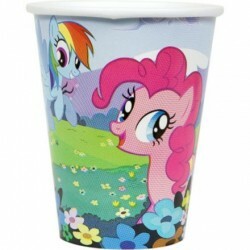 The cups feature a colorful background of ponies, flowers, and rainbows that makes these cups ideal for a young girl's birthday party. Eight cups come in each package. 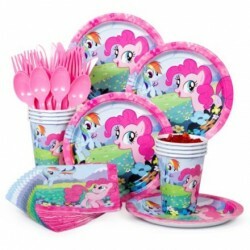 My Little Pony Napkins 10"
The My Little Pony Friendship Beverage Napkins are a great party item that can help set your table in a colorful, festive way. 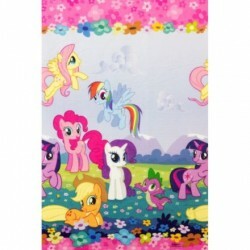 The napkins feature a pink, flowery border and cute ponies in front of a colorful background. Sixteen napkins come with each pack. 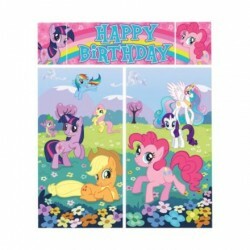 Our My Little Pony Paper Table Cover is a great party supply buy for a number of reasons. The colorful table cover acts as another great decorative touch and it can keep your table clean with all of those messy kids eating on it. 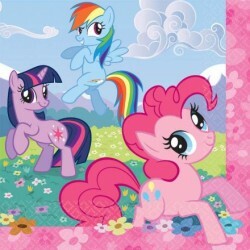 The cover features the My Little Pony ponies in front of a colorful background with a pink, flower accented border on each end. 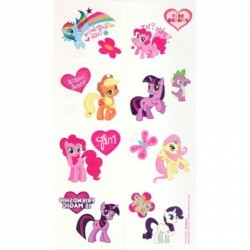 My Little Pony Blowouts make great party favors or fun little activities during the party. 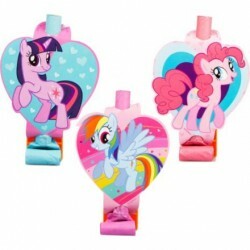 The blowout noise makers come in great colors and feature paper holders with the My Little Pony gang on them. The blowouts feature cute and colorful ponies. Eight blowouts come in each set. 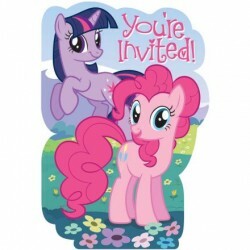 Size: 5 1/4" x 3 1/4"
The My Little Pony Invitations are a cute and fun way to invite all of your friends and family over to your big party. 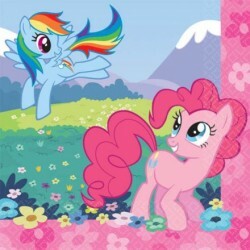 The invites feature two colorful ponies against a flowery background. Eight cards come with each order. My Little Pony Napkins 13"
The My Little Pony Lunch Napkins can help make your table colorful and festive for your party. The napkins feature a pink border with the My Little Pony ponies prancing around. These cute and colorful napkins are sold in packages of sixteen napkins a piece.